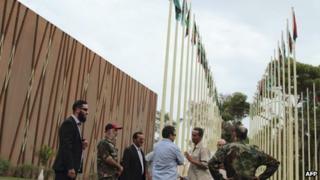 Dozens of gunmen have occupied Libya's parliament to register their anger over the formation of the new government. The militiamen are demanding some of the ministers be removed because they have links to the late Muammar Gaddafi's regime. The BBC's Rana Jawad, in Tripoli, says some of the gunmen are dressed in scruffy army fatigues and others in civilian clothes. She says some are from the western city of Misrata and others are from Tripoli, and few are willing to talk to the media. The street where the Congress lies appears to be in a world of its own. The usual mix of official security units charged with its guard are not there. In their place are armed men who are offering us water one minute, and asking us to leave a moment later. Some of the men are busily pushing back photographers and journalists. An aged man seated behind his anti-aircraft gun on the back of a truck appears less agitated and fiery than the others. He says: "We just want a real democracy. This new government is not a government, and Tripoli isn't even properly represented in it." "Some of them have had long ties with Gaddafi, we don't want them," a militiaman dressed in civilian clothes told the BBC. Despite largely peaceful elections in July, Libya's transition continues to be affected by instability. The new government has representatives from the two most prominent blocs in Congress - the Alliance of National Forces led by liberal former Prime Minister Mahmoud Jibril, and the Muslim Brotherhood's Justice and Construction Party. Mr Zidan said he had tried to strike a balance between Libya's different regions in making the appointments. According to his list, the defence and interior ministries would be headed by ministers from the eastern city of Benghazi, considered to be the cradle of last year's revolution that ended Gaddafi's rule. Two women are also among the ministers proposed by Mr Zidan.